Downtown Summerlin is the new retail and mixed-use hot spot located outside of Las Vegas, Nevada. 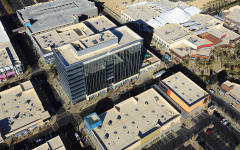 The development sits on a 106-acre property and includes public open spaces, residential living, an office building, department stores, shops, restaurants, a movie theater and two new parking structures. 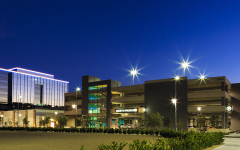 The two parking structures service the retail and entertainment center patrons. 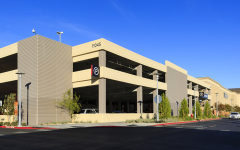 Parking Structure 2 is a 327,550 SF, five-level garage that contains parking for 951 cars. A pedestrian bridge on the second level connects to the adjacent Macy’s. The structure is cast-in-place and the exterior of the concrete is articulated with a horizontal corrugated pattern created with form liner at the large wall sections. 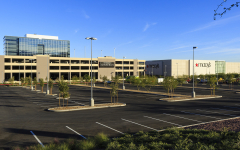 Parking Structure 3 is a 184,650 SF, three-level garage that contains parking for 484 cars. Two pedestrian bridges located on the north and east side of the garage connect to the adjacent Dillard’s and Macy’s department stores. The structure is cast-in-place with a single express ramp serving all parking levels.